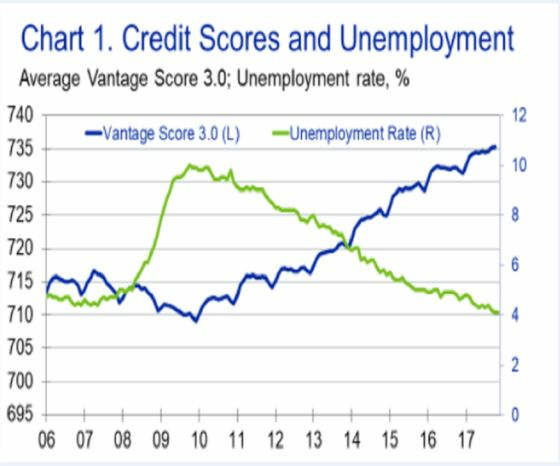 (Bloomberg) -- Consumer credit scores have been artificially inflated over the past decade and are masking the real danger the riskiest borrowers pose to hundreds of billions of dollars of debt. This means debtors are riskier than their scores indicate because the metrics don’t account for the robust economy, skewing perception of borrowers’ ability to pay bills on time. When a slowdown comes, there could be a much bigger fallout than expected for lenders and investors. There are around 15 million more consumers with credit scores above 740 today than there were in 2006, and about 15 million fewer consumers with scores below 660, according to Moody’s. The problem is most acute for smaller, less sophisticated firms that lend to people with poor credit histories, deRitis said. Many of these types of lenders rely mainly on the data supplied by Fair Isaac Corp., the so-called FICO score, and are unable or choose not to include other measures -- such as debt-to-income level, economic data or loan terms -- into their models for measuring risk, he said. Car loans, retail credit cards and personal loans handed out online are the most exposed to the inflated scores, according to deRitis. This kind of debt totals around $400 billion, with nearly $100 billion bundled into securities that’s been sold to investors, data compiled by Bloomberg show. What has analysts concerned is that cracks have already begun to show up in the form of a rising number of missed payments by borrowers with the highest risk, despite a decade of growth. And now with the economy showing signs of weakness, as seen with the recent inversion of the Treasury yield curve, those delinquencies could grow and lead to larger-than-expected losses for investors in riskier asset-backed securities. Fair Isaac Corp. created its FICO credit score product in 1989, and it’s still used by more than 90 percent of U.S. lenders to predict whether a would-be borrower is an acceptable risk. Most scores range from 300 to 850, with a higher score purporting to show that someone is more likely to pay back debts. A competitor, VantageScore, was created in 2006 by the three major credit raters Experian, TransUnion and Equifax. The concern that’s come up, Goldman and Moody’s say, is that lenders haven’t adjusted their underwriting standards as average credit scores have risen during one of the longest economic recoveries on record. So as cracks start to appear in the economy, someone whose credit score rose to 650 from 550 since the Great Recession may pay their bills more like they did 10 years earlier. Big banks and lenders have been savvy enough to recognize the problem and include many other factors besides credit scores in their underwriting. This is probably true for some of the smaller lenders too. FICO acknowledges that the credit score alone may not be enough to make informed underwriting decisions, and other factors need to be considered. But according to Goldman’s Young, the change in scores helps explain why missed payments on auto loans have significantly risen in recent years despite low unemployment, increasing wages and a relatively strong economy. In February, the Federal Reserve Bank of New York said the number of auto loans at least 90 days late exceeded 7 million at the end of last year, the highest total in the two decades that the data has been tracked. 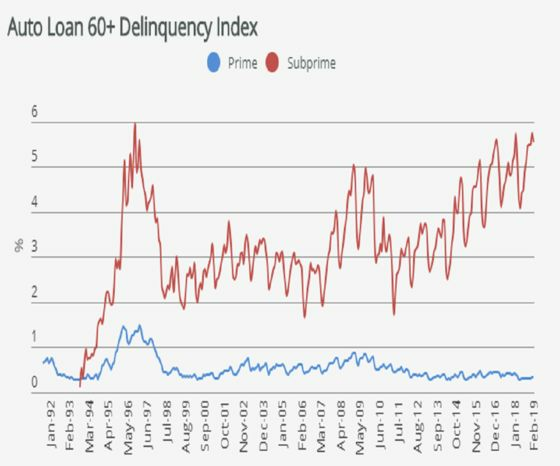 Meanwhile, the subprime segment of auto-loan asset-backed securities has seen 30-day delinquencies rise 81 percent since 2011, driven by looser underwriting due to rising competition between lenders, according to S&P Global Ratings. Marketplace lending -- loans handed out online -- has been flashing signs of stress. Missed payments by consumers and writedowns for online loans bundled into bonds increased last year, according to PeerIQ, a New York-based provider of data and analytics for the consumer lending sector. “We don’t see the purported improvement in underwriting just yet,”’ PeerIQ wrote in a recent report tracking marketplace lending. Russell-Dowe also avoids the retail credit card sector. So-called private label credit cards -- those issued by stores, rather than big banks -- saw the highest number of missed payments in seven years in 2018, according to credit bureau Equifax. She urges investors to do the difficult work necessary to figure out how each lender approaches underwriting and to determine whether they take other factors into consideration besides just scores.